Hundredth Year of Baseball, a Norman Rockwell painting, appeared on the cover of The Saturday Evening Post published July 8, 1939. This illustration is a favorite of Rockwell collectors and baseball fans alike, a true classic for the ages. An alternate title for this painting is Baseball Player and Umpire. This painting was Rockwell's fourth cover for The Post in 1939. In 1939, there were eight Norman Rockwell Saturday Evening Post covers published. This was also Rockwell's 187th overall cover illustrationout of 322 total for the Post. Rockwell's career with the Post spanned 47 years, from his first cover illustration, Boy With Baby Carriage in 1916 to his last, Portrait of John F. Kennedy, in 1963. The original oil painting, 34.5 inches by 27.5 inches or 87 by 70 cm, is part of the collection of the National Baseball Hall of Fame in Cooperstown, New York. It was donated to the Hall by Rockwell and Curtis Publishing. This illustration has been reproduced in four Rockwell commentary books, on page 41 of The Norman Rockwell Album, as illustration 195 of Norman Rockwell's America by Christopher Finch, as illustrations 251 and 339 of Norman Rockwell: Artist and Illustrator by Thomas Buechner and on page 114 of Norman Rockwell, A Definitive Catalogue by Laurie Norton Moffatt. I have seen pristine original copy of this cover still attached to the magazine sell for more than one hundred dollars on eBay. And to think it only cost five cents when it was published! This classic Norman Rockwell painting celebrates the game of baseball's first one hundred years of being played. Hundredth Year of Baseball was most likely painted during the winter months of 1948 and 1949. Rockwell meticulously planned each of his compositions. At this point in his career, he worked almost exclusively from photographs. Having obtained the many poses he needed to choose from his models, he no doubt set about planning his tribute to baseball's anniversary. This is a simple composition. There are only two characters. Rockwell uses these two characters and a bare background to take us on a trip all the way back to the dawn of America's pasttime. The pitcher wears a simple white uniform. His stockings are red and white striped, as is his cap and belt. I was unable to discover which team he is pitching for. Knowing how determined Rockwell was to be historically and factually accurate in his illustrations, there most certainly was a team that wore this uniform. 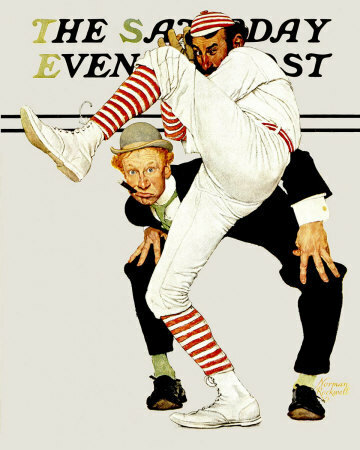 Hundredth Year of Baseball was only one of 322 Norman Rockwell Saturday Evening Post covers; Here is the list of Norman Rockwell Saturday Evening Post cover illustrations. If you know or have any good guesses, please use the comment form below. Be as specific as possible. The umpire, oddly enough, stands behind the pitcher. I know that there are umpires manning the infield in the modern game, but they do not stand directly behind the pitcher. The close proximity between them may have been done by Rockwell to be able to get the two characters on one canvas and have them close enough to give some detail.